Pollution in our waters come from a variety of sources and those sources are growing. There are approximately 55,000 chemicals in use in North America today, with about 1,000 new compounds formed each year. Add to that spills, small and large, of oil and other petroleum products along with reduced monitoring and enforcement of the laws that are suppose to protect our water – and the impacts only grow. Our society’s reliance on chemicals, including those found in fossil fuels, is more entrenched than ever before. Toxins are everywhere: in the air we breathe, in the products we use and on the food we eat and their impacts are not completely understood. All our programs focus to some degree how all of us can help reduce pollution in our local waters. 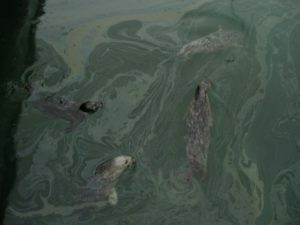 The impacts of oil spills on the marine environment are catastrophic and long lasting. Two and a half decades after the Exxon Valdez spill, which wiped out salmon and herring runs and killed 22 orcas, oil patches are still being found on remote beaches, and more than half of the species and habitats affected are yet to recover. The main sources of human exposure to toxic chemicals are the areas we once thought were safest: our own homes, offices and cars (Scientific American, Feb. 1998). Everyday consumer products pose more of a threat to our health than industrial pollution — even in highly industrialized cities. Most companies label only the “active” ingredients in their products, not the “inert” ones (substances that help make products work better). These inert ingredients can be even more dangerous than the listed ingredients. Fish and other aquatic life are also affected by what we use in our homes and gardens. Much of the hazardous waste goes down the drain into local sewers or septic systems, or is sent to regular landfills – eventually leaching into rivers, streams and coastal waters. Exposure to persistent organic pollutants can result in disruption to our endocrine (hormonal) system, which can damage developmental and reproductive processes. These chemicals are linked with dramatic increases in various cancers and birth defects, declines in immune system function, decreases in intelligence, and dramatic reductions in both the quality and quantity of sperm in humans as well as wildlife. We can reduce our exposure to toxic pollutants and their impacts on our environment, by getting informed and making wise choices – as individual consumers and as a country making decisions about the kinds of industries we want to build our economy on – to reduce the risk of toxins getting into our environment.